If you missed out on DC yoga week with its discounted classes and free lessons, then good news: Virginia Yoga Week is well underway. 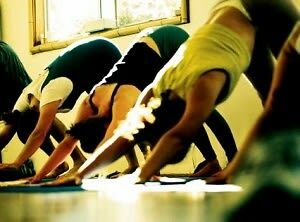 From now until the 17th, northern VA yoga studios will be offering special deals and freebies. The full schedule of participating studios and upcoming deals is listed on the Virginia Yoga Week website. Even after VA yoga week comes to an end, the opportunities for outdoor yoga in DC remain. In addition to the well-estalished yoga series in Dupont Circle on Wednesdays and Meridian Hill Park on Sundays, Yoga on the Piers at the National Harbor takes place every Tuesday and Thursday evening at 7pm, with live music. Another exercise prospect includes POP: Pilates on the Patio on Saturday mornings at Poste! The $19 fee promises a 45-minute pilates class followed by a well deserved mimosa! With the upcoming summer months and rising temps, the opportunities to get bikini ready are endless in DC!